Britain leaving the EU would be as positive for Europe as the fall of the Berlin Wall, the French far-right leader Marine le Pen has claimed. The leader of the National Front said that if the British public were to vote to leave the European Union it would herald the beginning of the end for the bloc. She said an out vote would be ‘marvellous’ for all those who ‘long for freedom’. David Cameron has promised a referendum on EU membership by the end of 2017 after the renegotiation which he hopes will see the return of powers from Brussels. Last week he was forced to drop plans to hold the vote next summer after European leaders told him they would not agree to any deal later this month. Member states in Eastern Europe are said to be against the Prime Minister’s demands for a ban on migrants being able to claim benefits for four years. The next chance for an agreement comes in February, pushing plans for a referendum as far back as the summer. Miss Le Pen compared a British withdrawal to the toppling of the Berlin Wall in 1989 – the symbol of the fall of Communism in Eastern Europe. ‘Brexit would be marvellous – extraordinary – for all European peoples who long for freedom,’ she told The Telegraph. 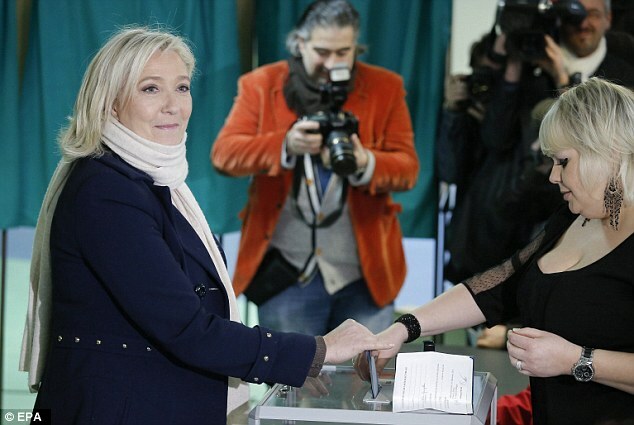 Opinion polls published across France today give the far-right National Front up to 30 per cent of the vote, as they take advantage of the Paris terror attacks and Europe’s migrant crisis to win votes. The polls leading into the regional elections today would put the National Front (FN) equal first with Nicolas Sarkozy’s Republic Party. 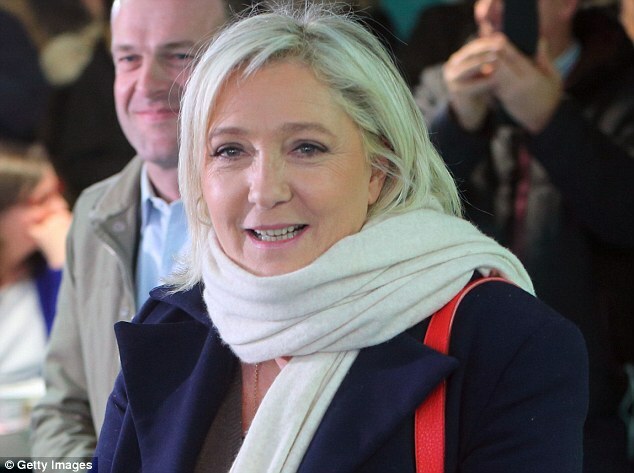 Massive gains for the party in these regional elections would put FN leader Marine Le Pen into an ideal position for her presidential bid in 2017. Today Iain Duncan Smith, the Work and Pensions Secretary, insisted Mr Cameron can still can get a deal on benefits deal out of Europe. 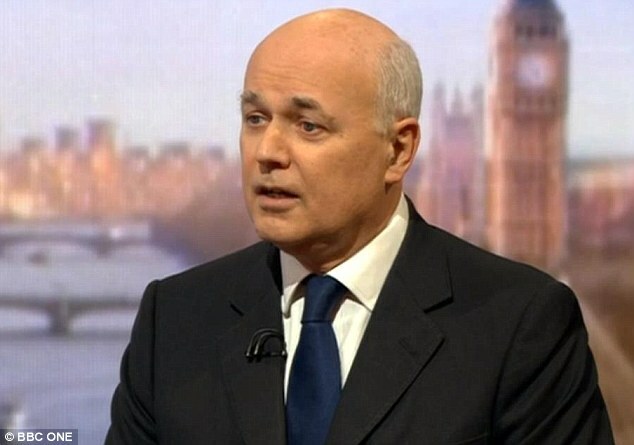 Mr Duncan Smith denied claims that Mr Cameron’s renegotiation is in trouble. ‘The delay, which everyone has said is a sign of weakness, is a sign of strength,’ he told BBC1’s The Andrew Marr Show. Mr Duncan Smith refused to be drawn on suggestions that ministers could get round EU objections that it is discriminatory to other EU nationals by extending it to British nationals as well. The Work and Pensions Secretary, who is widely thought to be in favour of leaving the EU, said he would make up his mind which way to vote in the referendum once he saw what deal Mr Cameron was finally able to achieve. ‘At the moment when the deal is on the table, that is when you assess whether you think it is in the benefit of Britain to stay in the EU or leave,’ he said. Eurosceptic Tory MP Bernard Jenkin said Mr Cameron would not succeed in getting much back from Brussels. ‘Iain knows in his heart this is a very lame renegotiation compared to what the Prime Minister was initially promising,’ said Mr Jenkin. He said Mr Cameron was initially talking about getting out of all home affairs and justice powers in Lisbon Treaty, and opting out of the European Court of Justice. Previous Previous post: EU Referendum: who’d have guessed?